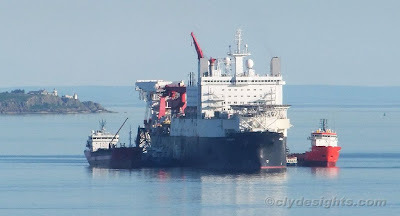 Five vessels feature in this picture, four of them utterly dwarfed by the massive pipe-layer SOLITAIRE. On her starboard side, on the left of the picture, is the small coaster MOORMERLAND which had arrived ahead of the bigger ship with a cargo of stores for her. Berthed outside her is the tanker AMALIA THERESA which was delivering bunkers to SOLITAIRE in preparation for her deployment off the Irish west coast. Alongside a pontoon secured to SOLITAIRE's port side was Clyde Marine's CRUISER - her stern is just visible - which was ferrying personnel to and from the ship. Sitting just off the pontoon was the PSV MALAVIYA THIRTY, using her dynamic positioning to keep station while her cargo was transferred to SOLITAIRE, which also used her DP while on the Clyde, as she had done last September.